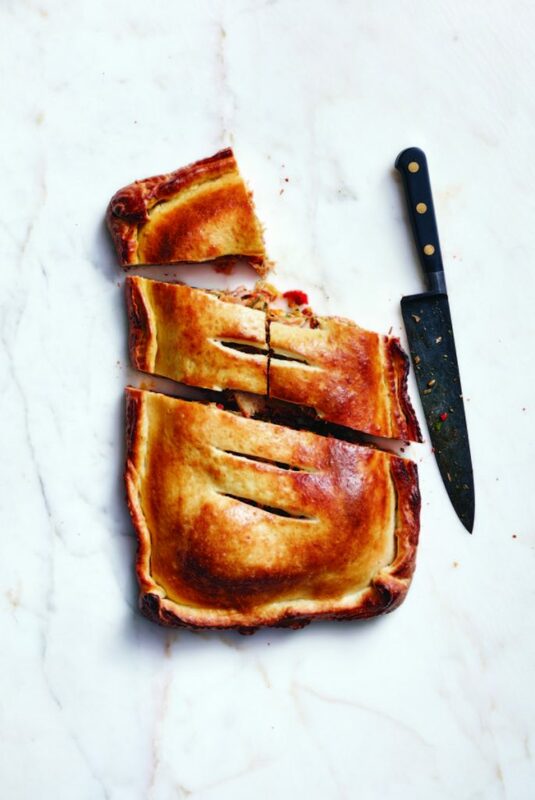 The cookbook promises an egalitarianism, but it devolves into elite tastes. ‘Potluck: Food and Drinks to Share with Friends and Family.’ Food and Wine Oxmoor House, 2018. $29.99. It’s a good chance that, sometime in the next month, you’ll be invited to at least one holiday party and feel compelled to bring something – a dessert, casserole or snack – to share. My advice in those situations is to stick to easy, crowd-pleasing favorites. Green bean casserole is a good bet, so are pigs in a blanket or deviled eggs. It’s the holidays, after all. Everyone wants comfort food, and why stress out concocting something complicated, time consuming, expensive and potentially disappointing? I suppose you might feel like showing off your appreciation of haute cuisine. I had a gift subscription to Food and Wine for years. Aside from a few good recipes and stories, my favorite part was the publication’s eye-roll-inducing pretension. An example burned into my mind of the preening entitlement lurking beneath the magazine’s glossy cover was a profile of a master sommelier who recalled a Dom Perignon versus Dom Ruinart champagne tasting on a “random” Sunday over eggs at her beach house. 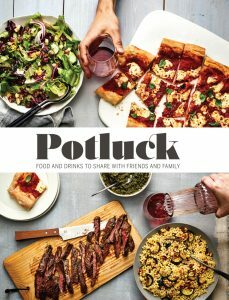 “Potluck” promises an egalitarianism, but devolves into elite tastes. The recipe for deviled eggs is straightforward enough, but the editors insist on adding crabmeat and caviar. A chicken and wild rice casserole, which by itself seems like a simple, homey meal, has more than 20 ingredients and takes an hour and 45 minutes to prepare. Ditto for its version of a chicken pot pie, except it takes nearly four hours to finish. The empanada gallega with tuna I made is a good example. It was really tasty, and even though I didn’t make it for a potluck, my dinner guests enjoyed it. But the preparation seemed extraneous. At the point that I was processing tomatoes with a box grater, splattering juice and pulp across my counter, cookbook and shirt, I’d had it. Why couldn’t I just have used some crushed tomatoes instead? Why go through this very weird process? It seemed an especially unnecessary step since I was wrapping all the ingredients between two cheap refrigerated pizza doughs. Complaining aside, with a couple modifications, I could see bringing the gallega to a party. But most of the other recipes do not seem worth the time and effort called for. Save yourself the trouble and wrap some little hot dogs in crescent roll pastry instead. People will love it. In a larger skillet, heat 1/3 cup of olive oil until simmering. Add the onion and cook over moderate heat, stirring occasionally, until just starting to soften, about five minutes. Add the green bell peppers, garlic and a generous pinch of salt. Cover and cook over moderately low heat, stirring occasionally, until very soft, about 25 minutes; add a bit of water if the pan is too dry. Meanwhile, in a small heatproof bowl, mix the saffron with the boiling water until dissolved. Let stand until cooled, about 10 minutes. Grate the tomato halves on the large holds of a box grater set in a bowl until only the skins remain, discard the skins. Add the roasted red peppers, grated tomatoes, brewed saffron and the paprika to the skillet and cook over moderate heat, stirring occasionally, until the mixture is very thick, about 10 minutes. Scrape the mixture into a colander and let drain for 10 minutes. In a large bowl, combine the pepper mixture with the tuna, olives, parsley and lemon juice and season with salt and pepper. Let the filling cool completely, about 45 minutes. Preheat the oven to 425 degrees F. Grease a large rimmed baking sheet. Unroll one of the pizza crusts on the prepared baking sheet. Spoon the cooled filling evenly on the dough, leaving a 1-inch border. Unroll the remaining pizza crust and lay it on top of the filling; crimp the edges to seal. Brush the remaining empanada with the egg wash and, using a paring knife, cut a few slits on top. Bake empanada for 13 to 15 minutes, until puffed and browned. Slide onto a rack to cool completely, about an hour. Cut into squares and serve.